What can the United States and its allies do about the Ukraine crisis? Sending in troops into Russia’s backyard is out of the question. Placing economic pressure on Russia may work to a certain extent, but the European Union depends on the Russian Federation for much of its natural gas, i.e. Russia can throw considerable economic damage back. One third of Russia’s gas supplies to the EU goes through Ukraine. In 2009, a pipeline closure in Ukraine caused serious shortages across Eastern Europe for several months during a particularly cold winter. While the West may believe that post-Soviet Russia has joined the world economy and is vulnerable to international market behavior, a large slice of western nations are dependent on Russia for their energy supplies. A strong response from Europe risks triggering a Russian reprisal that may jeopardize its ability to meet its energy requirements. Since 2009, measures have been taken to reduce Europe’s over-reliance on the Ukraine pipeline route with new production agreements and infrastructure investment. But Europe still depends on Russia for energy. Crimea is of vital strategic importance to Russia. What can Europe do if Russia halts gas supplies? Europe is coming to the end of a relatively mild winter, allowing it to accumulate energy reserves that if needed would last for several months. The EU can today more easily switch to supplies from Norway and Algeria. There are also other pipeline routes today from Russia that bypass Ukraine. Russia receives over $100 million per day from Europe from its energy sales. Three percent of Russia’s economic output comes from this income. Russia also knows that by becoming an even more unreliable supplier of energy to the European Union could be self defeating. The 2009 energy shock for eastern Europe triggered a search for a wider selection of energy suppliers. In 2009, forty-five percent of Europe’s gas came from Russia, compared to 30% today. Blocking supplies again would encourage Europe to taper down its dependence completely, which could eventually mean no income of much-needed hard currency income. If Europe places economic pressure on Russia and it triggers reprisals, both blocs could suffer. In fact, any kind of economic pressure could affect countries beyond Europe. A blocking of energy supplies through the Ukraine or from Russia would cause prices to increase. The current global economic recovery is fragile and vulnerable to several factors, including oil and gas prices. Many susceptible emerging economies would suffer even more volatility than they do today. Would fracking help Europe become more energy independent? The United States is well on the path to complete energy independence thanks to fracking (shale gas). By the end of 2014 the US is expected to overtake Saudi Arabia in oil and gas production. With the exception of the UK and a couple of other countries, many EU Member States have strong laws that either ban or severely restrict fracking. If they loosened those laws they would eventually become much less dependent not only on Russia for oil and gas, but all other countries. A major percentage of energy suppliers are politically and economically unstable. Russia holds 27.5% of the planet’s gas supply, according the US Energy Information Administration (EIA). The country has been investing in its natural gas, however, it does not have the necessary know-how or capital to significantly raise production. Russia has been talking to several western companies about developing rich fields in several parts of the country. According to the EIA, Russia needs an investment of at least $175 billion in its gas sector by 2020 if it is serious about becoming an energy leader. 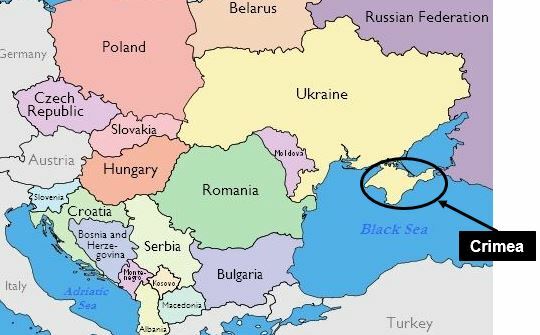 Ukraine, specifically Crimea is of vital strategic importance to Russia. However, the country needs capital and technology from outside. The United States, its allies and Russia need to tread carefully when considering economic pressures and reprisals.